DAYTONA BEACH, Fla. – Tyler Reddick checked his phone shortly after leaving victory lane and had 140 new text messages. Team owner Brad Keselowski quickly put it in perspective. “You get 140 text messages for your first win, and after your 40th win, you get a text from your mom,” Keselowski joked. was thrilled to win the Truck Series season opener at Daytona. Either way, this was a victory Reddick may never forget. With a little help from his teammate, Reddick won the Truck Series season opener Friday night at Daytona International Speedway. Keselowski wanted a 1-2 finish, and for the final 20 or so laps, it looked as if he would get it. He settled for the next best thing. Reddick held the lead down the stretch in the 100-lap race and had Theriault tucked in behind him on a final restart with six laps left. Theriault could have challenged for the lead, but chose to be a team player and block for Reddick. Theriault spent the final few hundred yards blocking, preventing anyone from mounting a charge. Erik Jones pulled to the outside and beat Theriault to the finish line. Jones was second, followed by Scott Lagasse Jr., Theriault and Ray Black Jr. 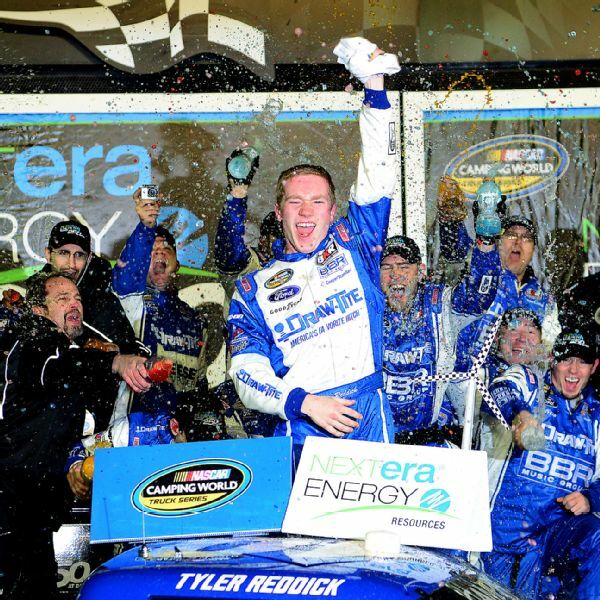 It was the first Truck Series victory for Ford at Daytona since 2006, ending an eight-year winning streak for Toyota. Fourteen trucks finished on the lead lap after a few wild crashes, including one that included more than a dozen trucks. Ben Kennedy got into the wall in the third turn, and drivers seemingly checked up behind him and created an accordion crash. The top five trucks, including Reddick, avoided the melee. It also left fewer challengers over the final laps. Several drivers tried to make runs toward the front and get by Reddick, but Ty Dillon and Daniel Suarez both went backward instead. Jones and Lagasse tried coming out of the final turn, but needed more room to get it done. And it gave Keselowski his first win at Daytona as a team owner. “It’s a huge day for our team and a statement of being able to win the opening race,” Keselowski said.